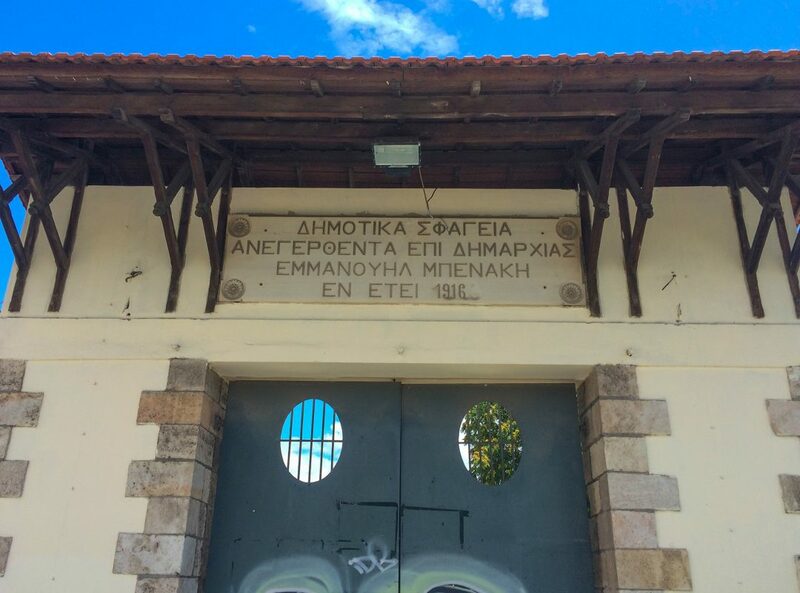 In a remote stretch of land to the north of the Observatory the first basic abattoir is established under the mayoralty of Demetrios Kallifronas (1837, 1840–1841). In his treatise on the Western Hills of Athens, the French Émile Burnouf makes mention of two abattoirs in 1849: the small one, to the northwest of the Observatory and the big one to the northern side of the ancient Barathron. During those years, as Kostas Biris characteristically writes, “the slaughtering of animals was taking place on the pavements, in front of the butcheries or anywhere else the butchers fancied”. In 1856, the mayor Konstantinos Galatis makes an effort to resolve the problem by ordering the construction of an abattoir on the riverbed of Ilissos, to the south of Philopappos. The abattoirs will remain there approximately until 1916 and then are relocated to the area of Tavros, during the mayoralty of Emmanouil Benakis. Burnouf 1856, 64–88; Biris 1966, 88. The entrance to the abattoirs in Tavros. The erection of the slaughterhouses in the area was of such importance that the settlement formed there obtained the name “Nea Sfageia” (New Slaughterhouses), and later, in 1936, it was renamed as “Tavros”.